Honest Ed's discount store is up for sale. The Bloor and Bathurst property is likely worth a small fortune and with Walmarts and Targets popping up everywhere, this is the beginning of the end of Honest Ed's. When Ed Mirvish passed away in 2007, I shared my memories of the place. Here's what I wrote about Honest Ed's. The most logical idea would be for Walmart or Target to buy it, preserve the exterior, renovate the interior (keeping it a bit tacky), and upgrade the merchandise. 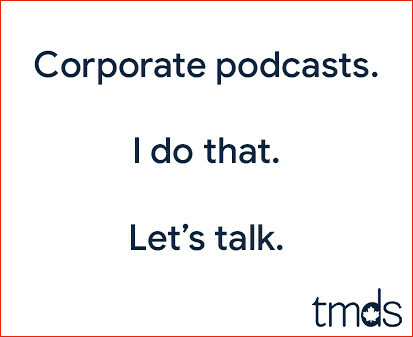 Possibly operating it as it's own separate entity. That would keep the neighbourhood happy. The place is full of dollar store crap, and Dollarama is probably eating their lunch. There's no question this will be the future site of another glass condo. After all, that's all that Toronto does now, right? City Hall licks their chops at the prospect of more tax revenue that these condos provide, at the expense of culture or character that helps to define a city. They've become hooked on condos like junkies on smack. Not an ounce of foresight. Is anybody talking about what's going to happen to the city in 25 or 30 years when the sheen of these fancy buildings wears off, and the start the inevitable spiral into disrepair? Eventually as they become less desirable and marketable, all that's left to occupy them are lower income lessees. The more affluent flee the downtown core, and voila! Toronto is the new Detroit. I think we may see a bit of both. The City is going to try to keep the exterior of the building. So, put a big box store into the first floor or two, then on top of that build a condo. Everyone seems to get what they want. My favourite memories with my mom as a little girl were going to Honest Ed's a few times a year. We would go down on transit but sometimes bought so much we would have to take a taxi home. After marrying I would still go down by myself to get that feeling that I got as a little girl with my mom. But the Walmart became more efficient for me when you guys were small and working full time Honest Ed's became a memory, a great memory. It's been a long time since I thought of Ed's warehouse and didn't he have a Chinese restaurant also? His son sounds like Conrad Black when he speaks, definitely not the folksy charm his father always had. I guess things evolve, but another Condo? The grid lock at the store somedays would make you wonder what it would be like with another 20 story condo in it's place. When I first moved out on my own, most of my lamps and pots and pans were purchased from Honest Ed's. Ah the joys of a misspent youth!! As an outside visitor, I have come to love this area of Toronto and every time I visit the city I try and stop by on Bloor Street to check out the stores. I used to like Queen Street West when I first started making regular trips to Toronto, but Bloor won me over with the amount of book/comic shops there, music stores, eateries, and of course Honest Ed’s. Thanks a lot David Mirvish. Six years after your father’s death and you are looking to undo all of what made and makes The Annex/Mirvish Village such special place to visit. I enjoy the store. One time I was looking for teashade sunglasses and couldn’t find them anywhere. I found them at Ed’s brand new, and I couldn’t believe they were only 33 cents. However, what has got me more ticked off are all the businesses in the area affected by this. Many of them long standing and in the area for decades, several houses-turned-businesses which give that unique look and feel as opposed to some boring squared off chain store. The Beguiling has grown to be one of my favorite comic book stores, and I love it at its current location. They opened a second store on Bathurst, Little Island Comics, in September 2011 and it too is also a great store. This place just started to lay down roots and now it will be displaced. I have always meant to step into Suspect Video; next time I visit I will be sure to do so. They have had the worst luck. They were forced out of their old location and moved to a vacant spot at Honest Ed’s and reopened there in August 2011. What went in their old locations place? A Dollarama – a direct competitor to Honest Ed’s which opened in June 2012. I have no clue how much impact Dollarama has had on Ed’s within a year, but it’s all very much a sign of the times where you see chains like Dollarama go in and see the fall of other local business. Sonic Boom, which was lucky enough to find a new location a quick walk away from their old place, almost seems to have gotten a one-two punch in the gut from Dollarama. That may not be true of course, but it is a coincidence that within 13 months of the chain being there, that Ed’s gets thrown up for sale. Can Sonic Boom survive another move? What made this area great is that some of my favorite stores were all in short walking distance. If all these stores splinter off to other areas of Toronto it kills the vibe, and I may not be visiting The Annex as much in the years to come. 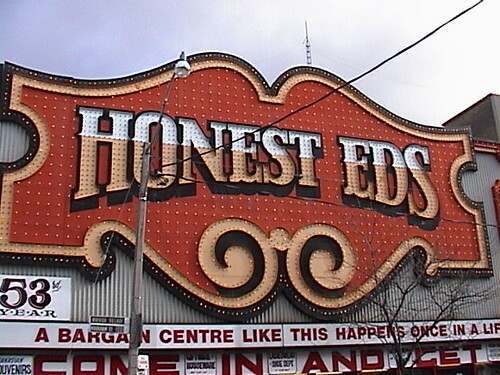 As much as I like the signs, I don't really give a crap about Honest Ed's itself. I'll be sad to see the Victory Cafe go. It's been a go-to ever since I discovered how wonderful craft beer is. Stephen unlike all these other assholes in this city you seem to get the point of what Honest Ed's is all about. David is no Ed & its shameful that his arrogance will be the end of a landmark for this city. & Mark no one gives a crap about you either. Sonic Boom appeared in Scott Pilgrim too. Must be a curse.